(i) Downwards Iso-product curves slope downwards from left to right. 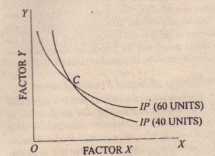 This is so because if the quantity of a factor X is increased, the quantity of factor Y must be decreased so as to maintain the same level of output. 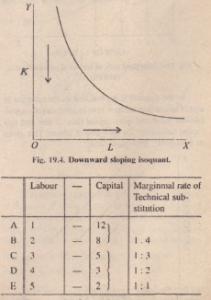 ln the figure 19.4 on y-axis, K (capital) and x-axis ‘L’ (Labour) IS quarts are negative sloping that means as the increase in one more unit-of ‘L’ than we have to decrease certain amount of capital (K). Due to this the iso-quant curve slopes down word from left to right. In other words it has a negative slope. 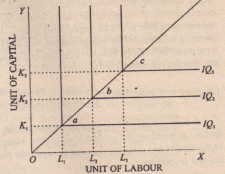 In the diagram it is clear that as the increase in unit of labour than we have to reduce the unit of capital. 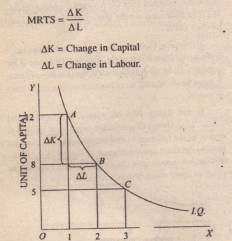 Initially more and more capital than is less and less capital substituted for each unit of labour. This gives us a ‘convex’. ISO quant curve. (n) Perfect Substituted. When the factors of production are perfect substitutes. then one factor can completely take the place of the other. They may, in fact, be regarded as one factor. 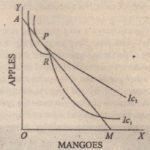 In their case, the marginal rate of technical substitution is constant. Hence, the equal product curves will be a horizontal straight line instead of being convex to the origin. 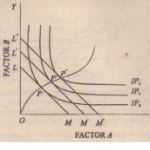 (b) Complem nl s, The complementary factors are those which are jointly used in production in a fixed proportion. If one of these factors is increased, the other must also be increased at the same time, otherwise no additional output win be obtained. 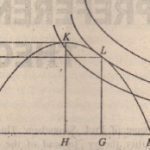 In his case, the equal product curves Will be right angled (i.e., one of the two arms being vertical and the other horizontal) at the combination of the two factors used in fixed proportion. K” K2′ KJ are tangent to ISo-quant IQI’ IQ 2 & IQJ’ which shows that above this point the productivity of capital is zero. 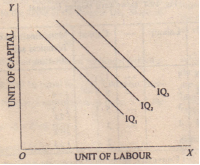 In the same way LI’ L2′ and L.l are tangent to IQI’ IQ 2 and IQJ which indicate beyond this point productivity of labour is zero. When we join KI’ K2′ K) and L” L2′ LJ we get the ridge lines. The ‘Ridge Lines’ are the loans of locus of points of iso-quant where marginal productivity of the concerned factor is zero. 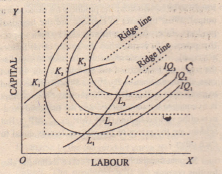 The ridge line indicates that the region onside the ridge lines are useless or uneconomic to the producer.